The JW Pet Giggler Ball “giggles” as it moves, or at least that’s what it’s supposed to do. There are no batteries required. A mechanism inside the ball moves back and forth, compressing air through a tube, to make the “giggle” sound. The giggle doesn’t sound that much like a giggle at all, and it really doesn’t “giggle” as it rolls. The ball needs to be shaken or bounced in order for it to really make sound. 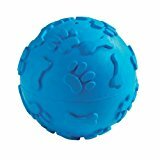 The JW Pet Giggler Ball comes in a variety of colors in both medium and large sizes. The ball may be too heavy for smaller breeds, but on the plus side, it’s made of hard, durable natural rubber. So, if your dog is a heavy chewer, it may hold up to lots of chewing. 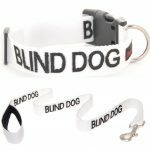 Is this a good toy for a blind dog? That depends. If you plan on using this ball for supervised play time with your dog, it will make a satisfactory toy for a blind dog. Otherwise, if you plan on giving your dog this ball for play on his or her own, it probably isn’t since it’ll be harder to track when it’s rolling. If you want to give this toy a try, I would suggest spraying it with dog safe essential oils or scents or perhaps leaving it in a bag of your dog’s favorite treats for a few days. It might be easier for your dog to track it by scent. 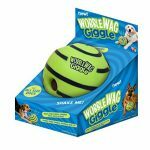 Honestly, I would recommend the Pet Qwerks Babble Ball over this toy or, perhaps, the Wobble Wag Giggle Ball (See our review here). Below is an example of the sound the ball makes. If you have this product and would recommend it or know someone it would benefit, please share this post!